I recently ordered and received a front bumper with bullbar from you for a Suzuki Sidekick. I am pleased to say it fitted perfectly and we were able to mount the snowplow onto this unit very easily. The only problem we had was that the bullbar stuck out too far forward and was resting against the electric motor mounted on the frame of the plow. This motor rises up and down which pulls a chain which lifts the plow blade. So the only thing we could do to fix it was to cut off the bullbar, and now the mount with the plow works perfectly. I have attached a picture to show it mounted – please let me know if you want to see more detailed pictures on how the plow fits and why we needed to cut the bullbar off. 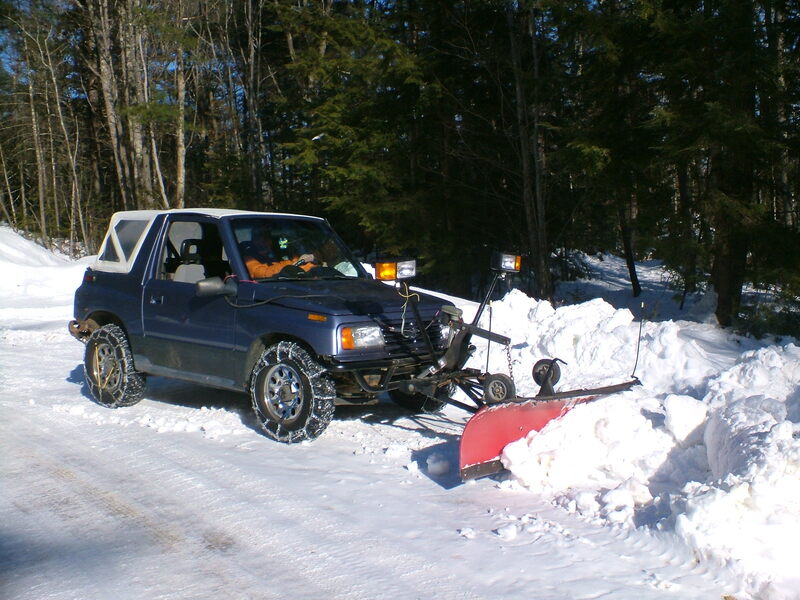 As I had been looking for a mount for my Suzuki for a plow for a long time on the internet and other places, you guys may want to consider marketing this unit as it seemed an easy adaption of your regular winch design. Again thank you for the swift response in making this unit and getting it shipped to me. It has been used already in 2 deep snowstorms and I am very very happy with it.